Travelling to Albufeira with children and taking advantage of everything this wonderful destination in the Algarve region, Portugal, has to offer is sometimes challenging. The most rational thing to do is sit down and study your options. What kind of activities with children can you engage in? Follow us on this adventure and find out. When staying with children in Albufeira, there is a mandatory venue where you definitely have to take your children to: Zoomarine. 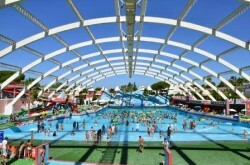 Located in Guia, just a few kilometres outside Albufeira and easily reachable by car, taxi or bus, Zoomarine has all kind of unique activities for you and your children to enjoy. Spending a great holiday in Albufeira means, of course, meeting dolphins, sea lions, seals, tropical birds and hang out with lizards and other reptiles. 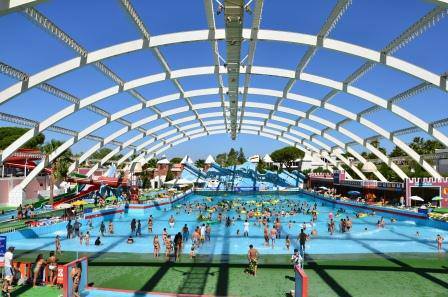 Zoomarine also features an aquarium with sharks, 4D cinema, and the most astonishing swimming pools and water rides. No matter what age your children are, they will definitely enjoy a day at the Zoomarine and take part of the number of different and amusing activities there are for children. 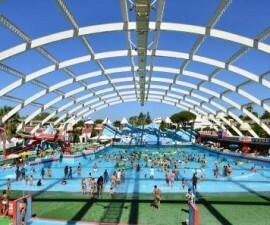 Located in Quarteira, a few kilometres from Albufeira, the Aquashow Park is one of the best in its category. The water & theme park features a number of different and daring rides, such as the Rollercoaster, the Air Race, the White Fall, the Wild Snake, the Foam slides, and a lot of swimming pools where you can have your children play all they long while you rest at their side. In addition to this, you will also be invited to watch presentation shows of such animals as birds of prey, reptiles, parrots, among others. A true paradise for children where a day goes by so fast it almost seems like one minute of fun! If you happen to be with children in Albufeira, Parque Aventura is surely the place to be, or at least a great option amongst many others for your holiday. Located just in front of the Santa Eulalia Beach, Parque Aventura features a number of activities for children that will keep them happy and entertained for many hours. Parque Aventura is a huge camp with all kinds of things happening and where humans meet with nature. Your kids will be able to climb trees, hike, and perform and complete other physically-challenging yet fun games and height trails. There is also a paintball area with 2.500 square metres with natural obstacles and available for the entire family, regardless of their age — although the minimum age for participating in the activities of Parque Aventura is 4 years old. 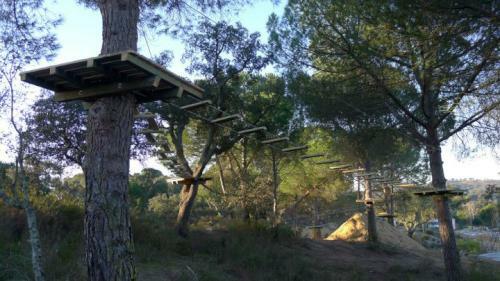 The “forest acrobatic park” is the main attraction at Parque Aventura with several paths and courses that make people move from tree to tree through a series of games and trails at varied heights. No physical training is required to enjoy the courses and other activities. There are, however, three levels for you to choose from, each with a different price rate. Prices range between € 10 and € 16 for a whole day on different courses, and paintball costs € 18. It is always a dread to find a nice, welcoming place for kids to enjoy themselves whilst the grown-ups are relaxing and having a drink after a full day of beach time, but not in Albufeira. This lovely resort destination has all it takes to keep everyone happy and entertained without much trouble. There are a few restaurants and pubs that are extremely family-friendly and put up their best work trying to keep the little ones busy and amused. One of them is Festa da Praia, a nice family-run restaurant located just a few metres away from Oura Beach and contiguous to the strip. In addition to tasteful, traditional food with a twist of international cuisine, Festa da Praia owns one of the most incredible restaurant play areas in Albufeira, with everything your children could wish for. Playhouse, swings, pool table, pinball machine and a couple of small rides are available for use both at lunch and dinner. 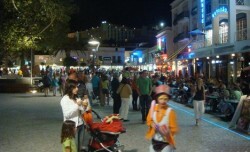 Absolbar is also another great venue to take your family and have a great time at night. It is located in Montechoro, right on The Strip, and run by a nice Portuguese-Norwegian couple, Paulo and Gry Lopes, who try to keep their customers happy and entertained in the evenings. Absolbar features a number of attractions, such as pool table, computers, play area for children, giant screen TVs and even karaoke. This will definitely add up to a wonderful night in Albufeira! 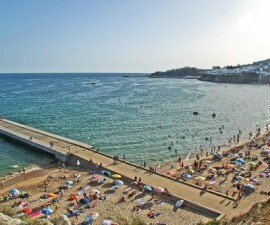 There is also, of course, an almost endless array of beautiful beaches where you can take your kids to, and spend an amazing time sunbathing and experiencing the warm water under the sunny skies of Albufeira, Portugal. You can also adventure yourself with water sports, which are available in almost every beach in Albufeira. Have fun with your children riding on the Flyfish or the Jet Boat and do not forget to take a little stroll around the shore with a paddle boat, an always enjoyable activity! Ask at your hotel reception desk about all your water sports options and they will surely be happy to present you with a few.